Wycombe District Council’s approved Site Allocations Plan of 2013 shows the path of the culverted River Wye as a pale blue dashed line. It flows below Oxford Road between Westbourne Street and the Archway Roundabout and then below the Abbey Way flyover until it branches off in front of the Police Station. In 2010, Wycombe District Council commissioned Peter Brett Associates to make a study of the feasibility of deculverting the River Wye through the town centre. The study was done on the assumption that the Abbey Way flyover would eventually be removed. The study left no doubt about the extensive opportunities for opening up the river. In particular, provided the culvert under Westbourne Street was enlarged (which has since been done) there would be no difficulty in maintaining the water close to ground level. 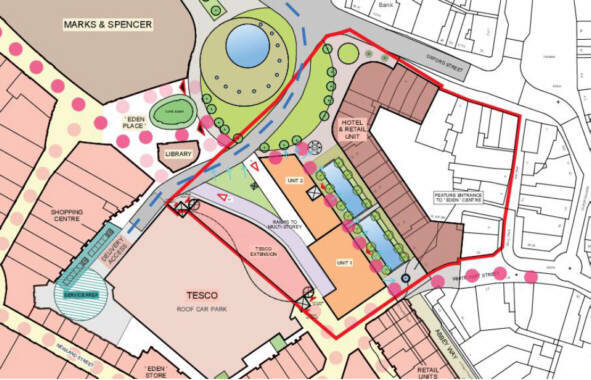 In mid-2018, we were shown the following plan for works outside Sainsbury’s which would open up the River Wye along one carriageway of the existing A40. 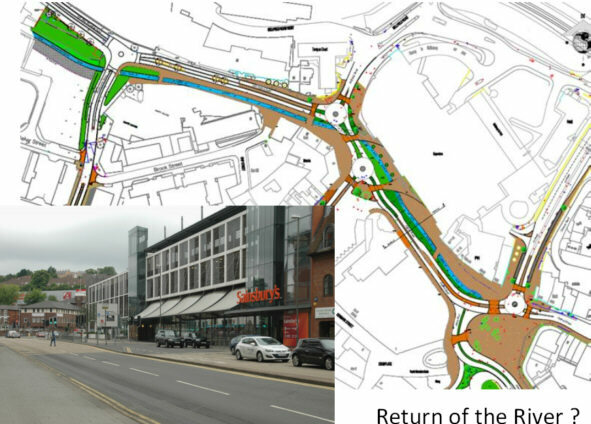 On 1st December 2018, the Bucks Free Press published this image received from WDC showing how the deculverting outside Sainsbury’s would look if viewed from what is now the Archway Roundabout. It looks pretty good! It has been reported that these works do not require the removal of the Abbey Way flyover or access to it. So, there is great scope for deculverting our historic River Wye in the immediate future right outside Sainsbury’s. We do hope that Wycombe District Councillors and their BCC colleagues will take the plunge and proceed with this.